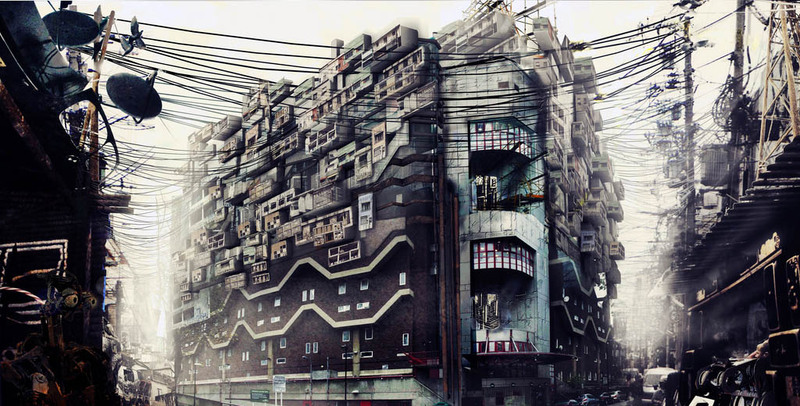 [Image: "Southwyck House," "inhabited by London's new robot workforce," by Kibwe X-Kalibre Tavares of Factory Fifteen]. Nic Clear, from Unit 15 of the Bartlett School of Architecture, recently got in touch with some links to his students' newest work, all of which explores architecture through the lens of both narrative and abstract film. Clear, as you might recall, instructed both Keiichi Matsuda and Richard Hardy, and there's some really fantastic work coming out of his studio. Amongst short films by Paul D. Nicholls, Jonathan Gales, Richard Reginald Young, and Christopher Lees, I was particularly struck by the premise (and visual execution) of Kibwe X-Kalibre Tavares's "Southwyck House," seen above. It is part of what Tavares calls "a collection of images of what Brixton could be like if it were to develop as a disregarded area inhabited by London's new robot workforce." To accommodate the rapidly growing machine-population, "unplanned cheap quick additions have been made to the skyline." [Image: "Brixton High Street" by Kibwe X-Kalibre Tavares of Factory Fifteen]. Together with the image "Brixton High Street," this mechanized borough presents a compelling visual backdrop for future narrative explorations—spatial, technical, economic, and sociopolitical—in a kind of robotization of favela chic. For more, see the Factory Fifteen website. really nice still images, especially that first one. reminds me of kowloon (http://www.deconcrete.org/wp-content/uploads/2010/03/Kowloon-Cross-section-low.jpg). not crazy about the video/hyper-computer animation, but i'd be interested in viewing the final product.